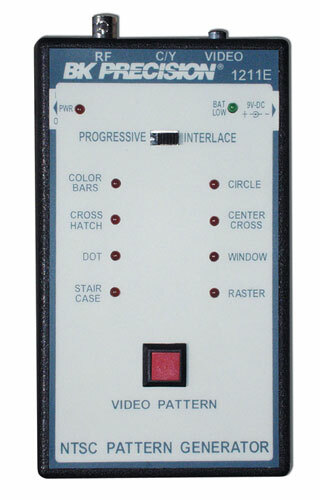 This handheld NTSC Pattern Generator is powered by a 9 volt battery or AC adapter providing NTSC color bars, crosshatch, dot, staircase, circle, center cross, windows, and a full range of color raster patterns. The outputs available are composite video via RCA connector, a RF output BNC connector, or an S Video mini-DIN output. Signals can be produced as an interlaced or progressive scanning mode.